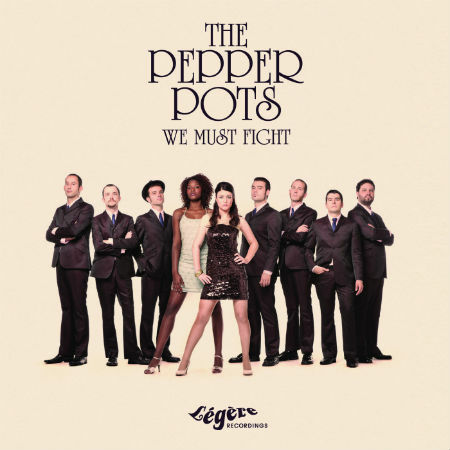 The Pepper Pots will release their new record “We Must Fight” on the back of 10 years and 6 albums, world tours that have taken in the United States, Japan, the UK, France, Russia and Germany and collaborations with some of the most important artists in the recent history of Soul music (Binky Griptite and Eli ‘Paperboy’ Reed) as well as the past (the Impressions, Maxine Brown). These 10 years have seen the band’s approach to Old School Soul mature into this, their best album so far, representing a leap forward for both the songs and the sound of the group. “We Must Fight” is a record that signals a number of changes. The first noticeable one is in the vocals, with the group for the first time employing two voices, those of Adriana Prunell and Aya Sima, who build up layers of emotion throughout the album, reaching the highest peaks. They are helped by some of the most personal lyrics that the group has written, inspired by the social issues around us today and the need for change, while still reaching out for fun, vitality and also love, the other great inspiration behind the record. Apart from the lyrics and vocals, the group’s sound has also undergone an evolution by combining the classic Motown sound, which has made them one of the stand-out new soul acts, with deep soul from the late 60s and early 70s, incorporating thrilling string arrangements, percussion, keys and guitars, and creating a deep groove which was already hinted at on “Train to your lover”. For the album’s recording, the Pepper Pots were back in their own studio, brimming with analogue equipment from the golden era of Soul. Alongside them and fine-tuning the vocals has been Binky Griptite of the Dap Kings, one of the most important names in the new soul scene, a man who lists collaborations with Amy Winehouse, Janet Jackson, Sharon Jones, Lee Fields, Lily Allen, Ghostface Killah, Nas and Robbie Williams, among others.